Latiff Mohidin: Pago Pago (1960–1969) is presented by ILHAM Gallery in collaboration with National Gallery Singapore and Musée National d’Art Moderne – Centre Pompidou. Latiff Mohidin: Pago Pago (1960-1969) traces a formative period in the artist’s practice during the 1960s as he journeyed across Europe and Southeast Asia. The phrase in its title, “Pago Pago,” was coined by the artist to evoke the consciousness that emerged through these travels. 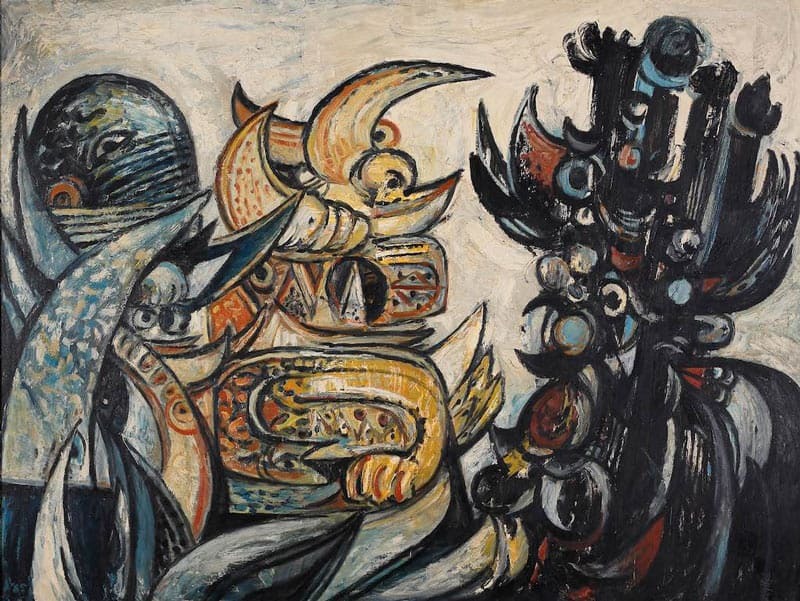 A way of thinking and working that sought to challenge the dominance of Western modernism at the time, Pago Pago led Latiff Mohidin to explore a syncretic approach to form in his art and enter dialogues with other avant-garde thinkers in Southeast Asia. Latiff Mohidin: Pago Pago (1960–1969) features over 70 paintings, drawings, and prints, supplemented with archival documents, and situates him in dialogue with his European peers. The historical backdrop for this exhibition is the early 1960s when Latiff Mohidin began his formal art training at the Hochschule für Bildende Künste in West Berlin. There, he studied the German language and focused on typical art school subjects such as still life, landscapes, and printmaking. Yet, Berlin also initiated Latiff Mohidin into the burgeoning debates of the time within German art circles, especially how the pre-War German self could be recovered and the evolving concerns surrounding modern art’s use of the so-called primitive image. The city offered Latiff Mohidin access to expressions of a progressive ethos from the ground-breaking movements of Cubism, Futurism, Dadaism, Constructivism and Surrealism, while allowing him to examine the linkages between this progressive ethos and his own ancestral imaginary. In this context, Latiff Mohidin’s 1961 encounter with a series of Thai and Khmer relics resembling pagoda forms at Dahlem’s Ethnological Museum of Berlin, from which the word “pagoden” and later “pago” emerged, needs emphasis. Upon closer study of Latiff Mohidin’s Berlin years, one notices a significant transition in his mode of working. The artist became increasingly enigmatic, activating a Minangkabau sensibility encountered during his rural upbringing in British Malaya. Termed “merantau”, this sensibility is defined as voluntarily leaving one’s home and the familiar. Latiff Mohidin returned to Southeast Asia in 1964 with the hope of reengaging with the region. When he departed for Europe, various nationalist movements had begun to prevail across Southeast Asia. By 1964, independence from colonial rule was no longer just an aspiration, but inevitable. 1965 was both a formative and disruptive year, as Singapore separated from the Malaysian Federation, whilst Indonesia and the Philippines contested the very logic of segregating Peninsular Malaysia and North Borneo from its historical host, the Nusantara, the Malay world. May 1969 would mark a turning point in Malaysia as sectarian violence broke out in Kuala Lumpur, leading to major shifts in the social contract with significant effects on cultural production. Latiff Mohidin journeyed through these shifting political configurations, as he traveled extensively in the region rom 1964 to 1969. Whilst he acknowledged the potency of ideological formations at the height of the Cold War, Pago Pago stood in opposition to overt doctrinal write. Latiff Mohidin sought out a different enterprise: to open a new sphere in what he calls the “region-intellectual” could find form. Throughout the 1960s, Latiff Mohidin engaged individuals of his generation (who identified as the “avant-garde” of Southeast Asia) from Goenawan Mohamad in Jakarta to Thawan Duchanee in Bangkok and later Salleh Ben Joned in Kuala Lumpur. The aim was to invert the previous generation’s initial response to European modernism, which had been largely premised upon resisting the colonial. The challenge was to formulate an aesthetic sensibility that charted the inner world of the artist amidst immense ideological and conceptual flux. How does one advance the mediums of painting, drawing and writing to suit local milieus? If the 1960s could be characterized as a decade when artists from previously lesser-regarded regions such as Latin America and Africa established a locus of participation in the major redraft of Modernism, then Pago Pago was arguably one of the foremost conceptions at the time, manoeuvring Southeast Asia into a similar position as a source of new ideas for modern art. This exhibition invites visitors to observe the formation of a regional avant-garde, via the microhistory of an individual in Southeast Asia. Latiff Mohidin’s Pago Pago series is made up of sketches, paintings, sculptures, prints and poetry. The poetry of the Pago Pago years is in free verse form and consciously breaks from the traditional structure of the Malay pantun and its quatrain “a-b-a-b” rhyme scheme. The sketches of phenomenal entities, from the temples of Angkor to the bamboo rhizome and heteromorphic barnacle, offer insights into Latiff Mohidin’s cosmic perspective. As one moves between canvas, paper and ink, each Pago Pago form emerges from the ground like a biomorphic object. In some cases, these manifestations blend into one another, highlighting how all forms carry an element of interdependence. With each visual strand and poetic fragment, Latiff Mohidin offers a Pago Pago-esque life-world that measures time not in linear but cyclical flows. This exhibition was conceived by Catherine David and Shabbir Hussain Mustafa. It was first presented by National Gallery Singapore in collaboration with the National Museum of Modern Art, Centre Pompidou in Paris from 27 February to 27 May 2018. LATIFF MOHIDIN (b. 1941) is Malaysia’s leading modernist painter and poet. His passion for painting and drawing was evident from an early age and after his first exhibition at the Kota Raja Malay School in Singapore, he came to be identified as “the magical boy with the gift in his hands.” In 1960, Latiff Mohidin was awarded the Deutscher Akademischer Austauschdienst (DAAD) scholarship to study at the Hochschule für Bildende Künste in West Berlin, Germany. Upon his return to Southeast Asia in 1964, Latiff Mohidin embarked on an extensive journey through Indochina and the Malay world, establishing affinities and conversations with avant-garde artists and intellectuals of the time. This moment, which he evokes through the phrase “Pago Pago,” has found a significant place in writings on Southeast Asian art. In 1969, Latiff Mohidin was awarded the French Ministry of Culture Scholarship to study etching in Paris at the Atelier Lacourière-Frélaut, followed by the John D. Rockefeller III Grant for a residency at the Pratt Institute in New York. Latiff Mohidin remains connected to leading figures in the discussion about Southeast Asian aesthetics through his conversations with other avant-garde thinkers from the region. Latiff Mohidin’s artistic practice is often linked to his literary activities He first became recognized as a poet when he published his collection of poems Sungai Mekong in 1971, which has since been translated into multiple languages. Like his art, his poetry is a methodological wandering that resists ideological systems and structures, offering an extended interrogation of the artist’s interior world. Many of these thoughts are reflected in GARIS Latiff Mohidin dari titik ke titik (LINE Latiff Mohidin from point to point), a work of immense literary prowess that was first published in 1988. It grapples with the position of vernacular cosmopolitanism within the story of global modernism, which still defaults to Europe. Latiff Mohidin’s literary and painterly world is also heavily informed by the writings of Jorge Luis Borges, Chairil Anwar and Johann Wolfgang von Goethe amongst others. Breaking down disciplinary boundaries between the visual and literary, in 2012, Latiff Mohidin published his translation of Goethe’s Faust (Part 1), a figure who has fascinated him since his encounter with German literature in the early 1960s. Latiff Mohidin lives and works in Penang Island, Malaysia.